That's why it's easily on the top of my recommendation list for cheap but good tablets for kids and regular users, and today I can even up my endorsement thanks to its latest price dip on Groupon. 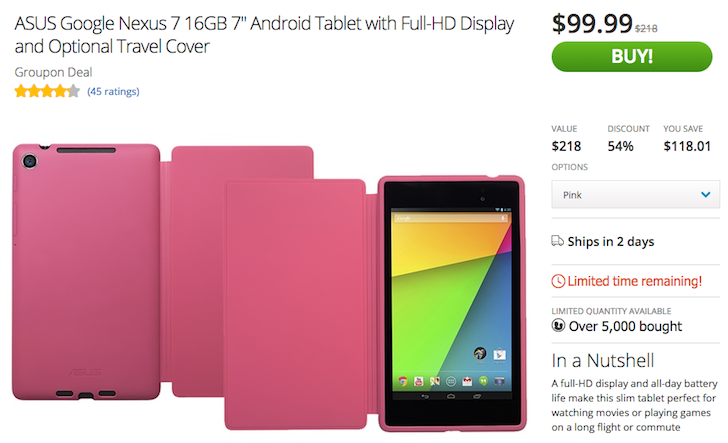 The online retailer is dropping 16GB Nexus 7s like they're last year's used Christmas ornaments. It was selling the tablet for $124 less than a month ago, then it lowered it to $109.99, and now you can find it for less than a hundred bucks. Will it ever get to $50? Will it be free by February? I don't know. I just know that this tablet is easily worth the $99.99 price tag, even two years after its release. The naked black tablet version is out of stock, but you can grab one with a grey or pink travel cover for the same $99.99. If you want the green or orange covers, however, you will have to add $10. Bummer.